for a reasonable price, and are made in Montana. This is an entry level sled, for deep snow, the bed actually floats the sled on the snow. An Adanac kit toboggan sled. 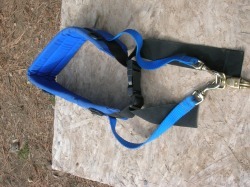 An Adanac zima custom x-back harness. 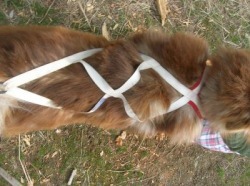 Zima harnesses are are a top quality harness. This harness is designed for racing, they can be made in many colors of webbing and padding, reflective tape can be added for better visibility in low light situations, and they can be custom made to fit any sled dog. Dog boots are used to protect injured paws, improve traction on slick surfaces and to protect paws in rough conditions. This boot is made from a very tough materiel. And is used to protect from the cold and rough trails. 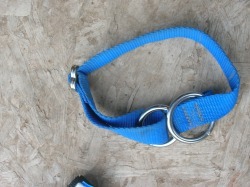 An Adanac full circle collar. and are made without buckles that wear out long before the collar, so these collars last a long time. 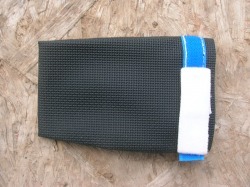 They can be made in several colors, in limited slip and padding can be added to prevent collar rub. Ski-joring is a very popular sport amongst dog sledders. These belts are made for the comfort of the skier. They are used to connect the person to the dog(s), without having to hang on to the lines. This belt has a panic snap to release the dogs in an emergency. Dog runs are made in various sizes, shapes and different types of wire. This one is 60' long by 50' wide by 6' tall, out of welded steel wire, though most are made of chain link. As you can see we mushers will take what ever we can get.